Getting up at the crack of dawn doesn’t seem to be such a big ask when it happens at eight, but the cumulated effects of the last several days had taken their toll, and neither of our bodies were quite as willing to move as efficiently as our minds said they should. While the one who normally gets things done so efficiently set to work on her final bits and pieces, the other of us with all of the “heavy” blokey jobs still to do, but with a precise plan to work without ceasing or stress, inflicted a small but somewhat recalcitrant wound in the back of his hand. A few plaster stitches and a visit to the doctor for a compression dressing fixed the bleeding. Having often boasted that he could do these jobs with one hand tied behind his back, his day of reckoning had arrived. Meanwhile the small army at Buitenbeentje (pronounced something not at all like “Bert’n’Benjie”) were not suffering such procrastination. 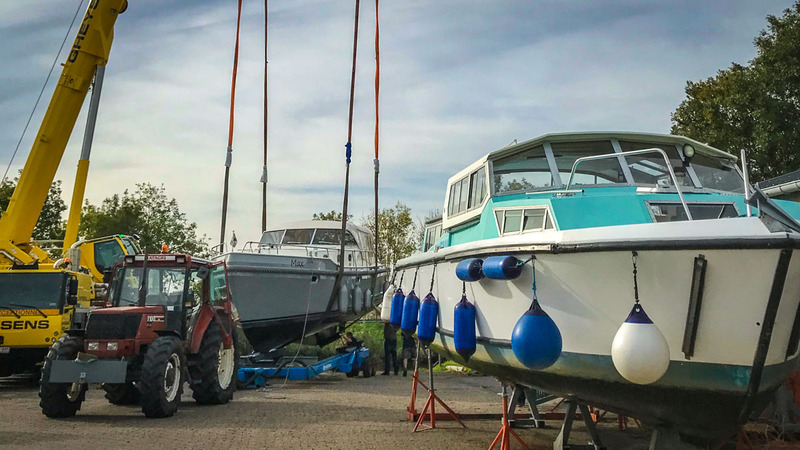 With thirty boats to lift, clean and store the team were working with such precision that one would have been forgiven for thinking they were in a country with much higher hills than Belgium has. Before we could say “well that’s that then”, “Max” and “Joyeux” were safely tucked up for the winter, and their owners had retreated into that wave of silence and exhaustion that marks the end of every grand adventure. I will pronounce it Beetlejuice. Beetlejuice's slip.